Bubbles and I recently made a trip to Germany to visit a friend I’ve known since I was eight. The beauty of this friendship is that until four years ago, we hadn’t actually met each other! You see, K and I were childhood penpals and started writing to each other at a time when exchanging letters and sharing stories about your lives were not fraught with risks. It was a time before the computer became a household product and the world was relatively devoid of paedophiles and impostors! Having said that, her world then was instead filled with an ideological divide; democracy on one side and totalitarian dictatorship on the other side. Not exactly without modern day evils! All my letters were addressed to West Germany, not just Germany; but as an eight year old I did not have the maturity to comprehend the severity of it all. I still remember the day I got her first letter. I was so excited to hear from a girl from an exotic land! I was always mystified by the faraway land of Europe. My only knowledge of it consisted of what I had learnt from the tv, looking at my dad’s old photos from his travels around Europe and some souvenirs scattered around the house. Europe to me was a land where people were white and had blue and green eyes, had beautiful tulips and windmills and four beautiful seasons with snow in the winter. I used to watch enviously a song sequence in the Hindi movie Junglee where Shammi Kapoor cavorts in the snow with his leading lady and tell myself that someday, I would visit that magical land and dance in the snow and have snowball fights. K and I kept in touch all these years, through letters the first ten years and then via email when we both had access to the internet. We lost touch intermittently, while she spent some years in China, and I spent my first few years in the UK, but we always managed to contact each other, even if a good year passed in between. We finally met a few years ago when she and her husband visited us enroute to Scotland. It was a funny experience meeting someone you’ve known all your life and yet is somewhat a stranger to you. Then two months ago, we started emailing again and she suggested we visit her. 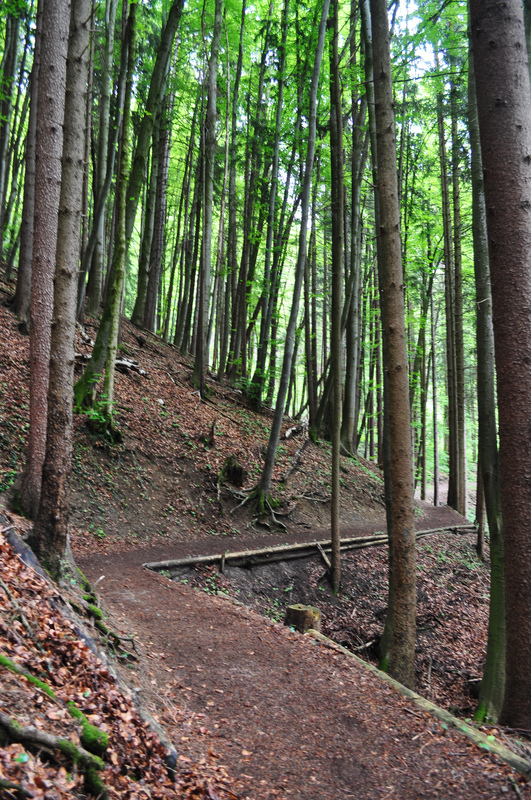 We took her up on her offer and headed to Holzkirchen, some 35km south of Munich. The first day was somewhat wasted by bad weather so we spent most of our time catching up indoors and cooking dinner: a fusion of Malaysian, German and French dishes! 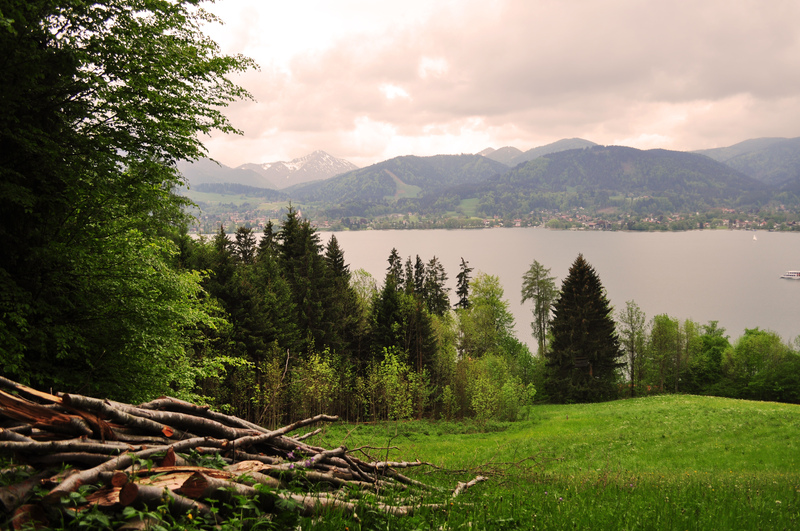 The next day, we ventured out to Tegernsee for a hike up the mountains. 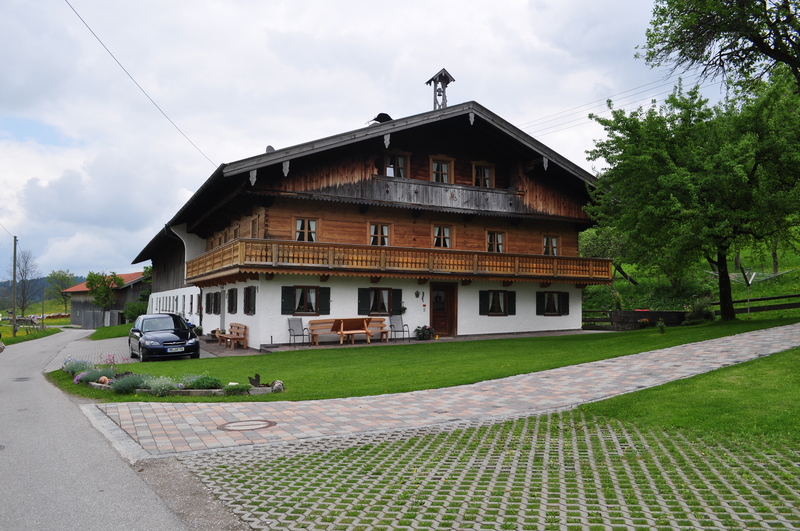 We walked past a farmhouse, which was quintessentially Bavarian in its architecture. The houses are part-brick part-wooden, with encircling balconies that are perfect for sitting out on a warm summer evening. 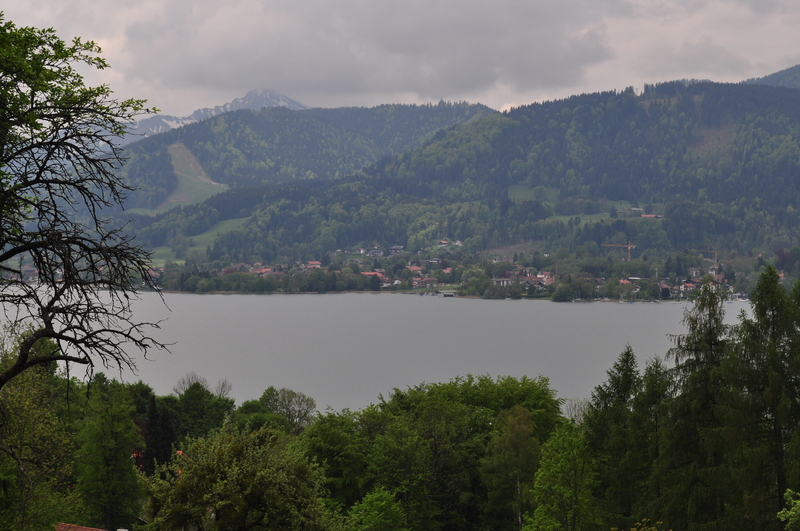 As we hiked up the mountain, we were greeted by splendid views of a lake and mountains on the other side. As this was a pretty miserable summer with temperatures constantly plummeting to near-winter levels, paradoxically we enjoyed a breath-taking view of snow-capped mountains. The snow would have normally melted by May, when we visited. 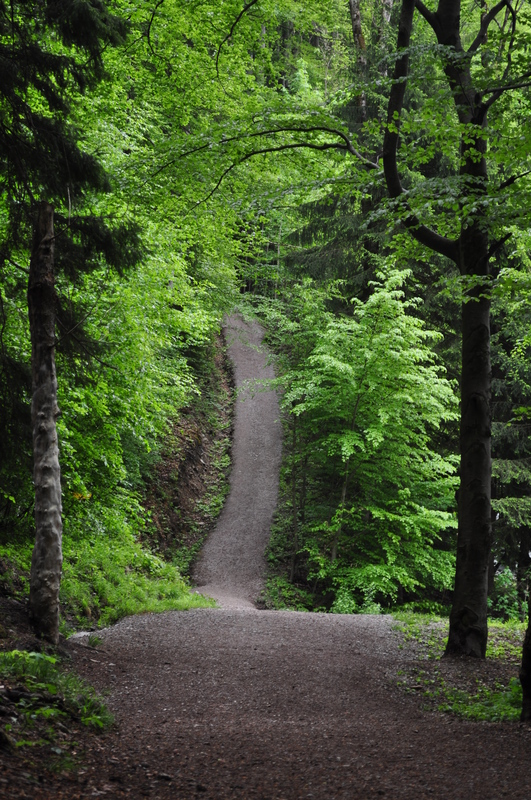 The air was fresh and the grass and leaves, truly green. It started raining sometime after we struggled up this road, and so we decided to head for some lunch rather than hike in miserable weather. 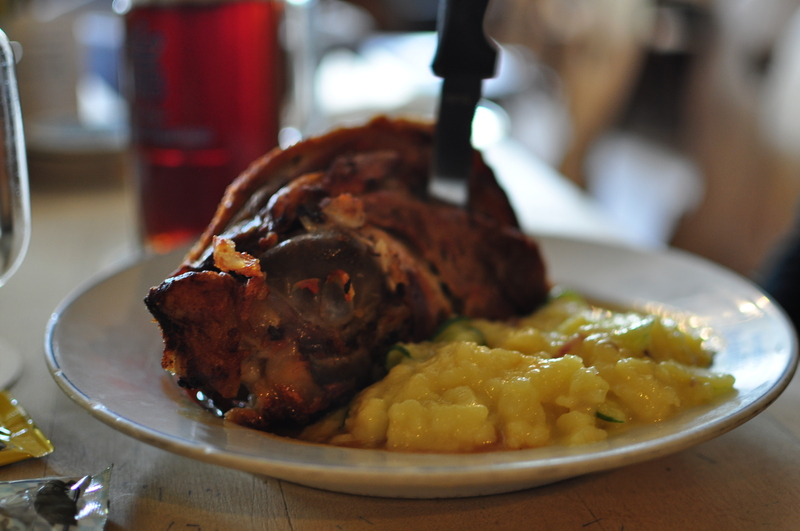 I can’t quite remember which restaurant we went to, but it was a Bavarian restaurant serving traditional Bavarian food. We headed for a late lunch…it must have been 2pm but the place was packed with people. A sure sign of good food! As we walked past several tables to ours, I thought I saw ice-cream being served on a plate. Rather odd, I thought! 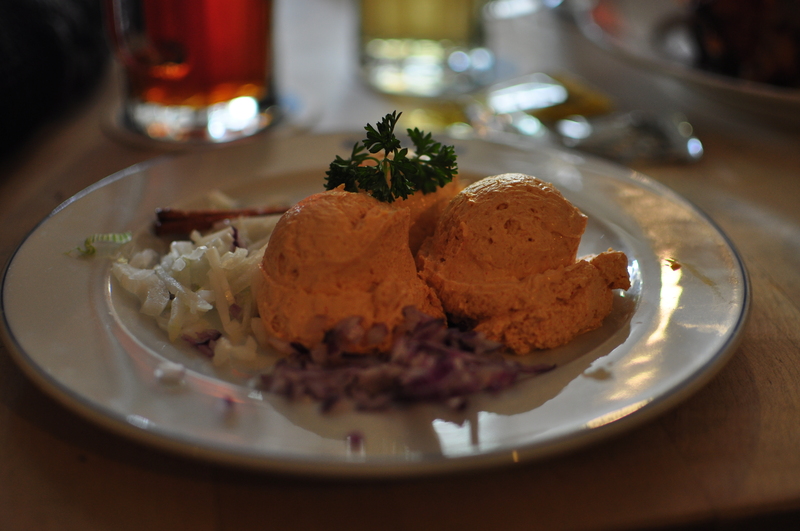 Little did I know until my friend ordered the same dish, that it wasn’t ice-cream, but ‘Obatzda’, a traditional Bavarian ‘snack’ of cheese served with onions and pretzel sticks! I hadn’t noticed the onions earlier, you see! 🙂 It really looked like two scoops of ice-cream! It tasted very nice, the fresh onions giving a nice zing to the otherwise mild cheese. I thought this shot of Bubbles’ beer was quite nice. So was the beer! 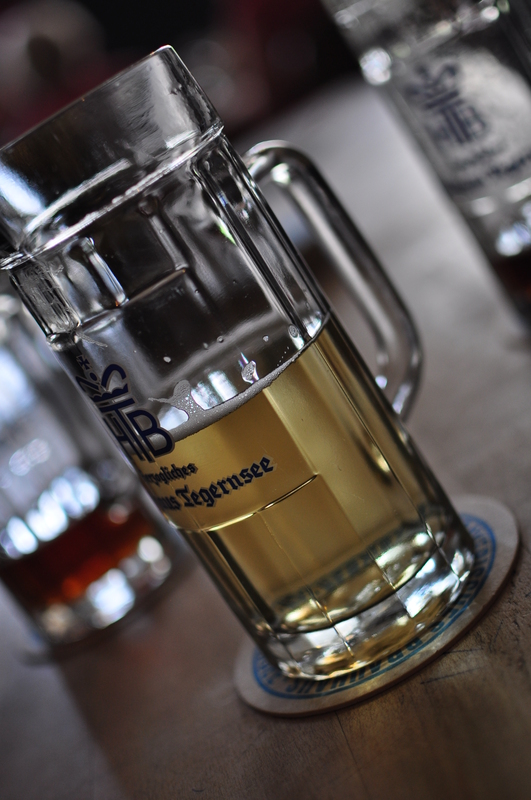 I’m not usually a beer drinker but I felt the beer in Germany was real good. My food was the last to arrive: potato fritters with sauerkraut, but I was too famished by then and not in the mood to take any more photos! Later that evening, we bade farewell to K and headed back to Munich reluctantly. I couldn’t help but contemplate nostalgically about how we’ve played a part in each other’s lives all these years. She couldn’t be more Asian with her stacks of Chinese books and Indian recipe books, and I moved halfway across the world to live in the land she exposed me to through her letters. Has your life been enriched by penpals? Tell me about your experience or just yap away about anything else! I’d love to hear from my readers.